Medium sized, fixed blade sheath knife from the Strider stable. Ok, this isn’t really a review, more like a boast/brag on my part that I have something cool. Humour me, it’s the only entertainment and meaningful relationship I have at the moment whilst stuck in a mining town. 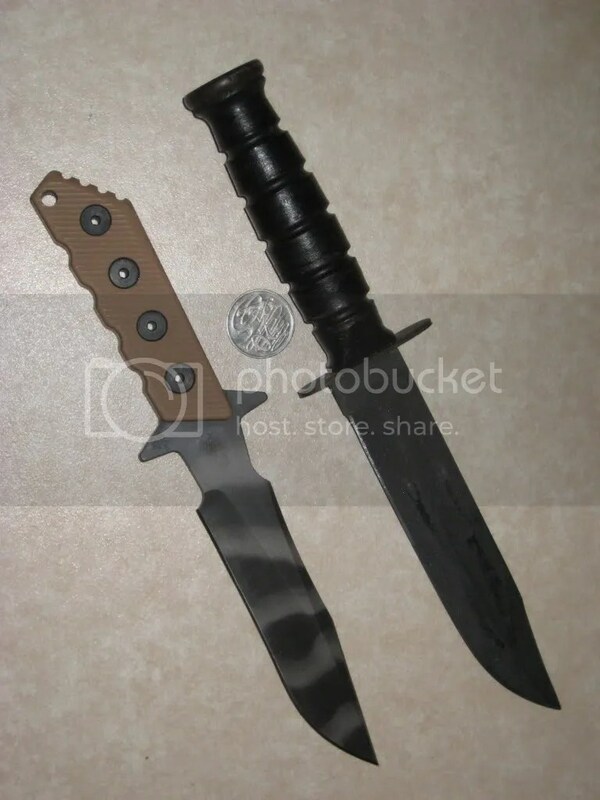 Compared to the Ka-Bar on the right. A medium sized fixed blade from the Strider stable. 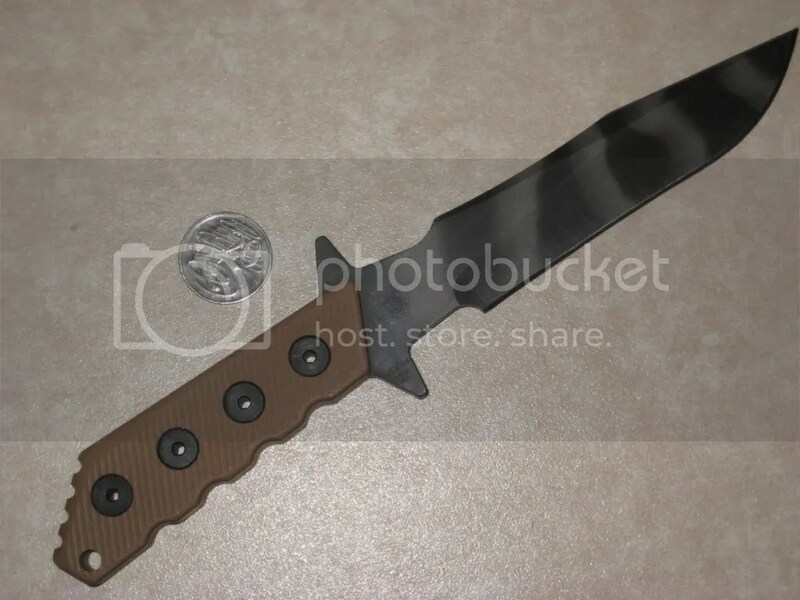 Apparently made in conjunction with the American Special Operations Association as a commemorative knife, the SOA is 27.9cm long (total length), with a blade length of 14cm. A single piece of S30V stainless steel cut with small integral guards. Finger grooves on the spine and toe(??) are also cut into the design. Edges have been slightly “melted” so as not to cause blisters or other problems. Handle scales are a very tough, somewhat strange looking, yet very ergonomic and comfortable slabs of G10 fibreglass. My research indicates that the G10 slabs provide a UV stable, stain resistant and very scratch resistant handle material, well suited for knives intended for hard use. The tiger stripe appearance on the blade is a result of the BOS heat treatment. It also aids in differentiating this product in a saturated market, as well as aid in camouflage and concealment by breaking up the outline. There’s nothing worse than having a big, bright shiny “LOOK AT ME! !” blade when drawn. Sheath is made by Eagle Industries, which has many mounting options to suit any user. Sheath can be worn vertically drop-leg style, medium height or high on the belt. Options also exist for the sheath to be mounted horizontally if required. It’s also MOLLE compatible, and apparently can be properly secured for airborne jump operations . 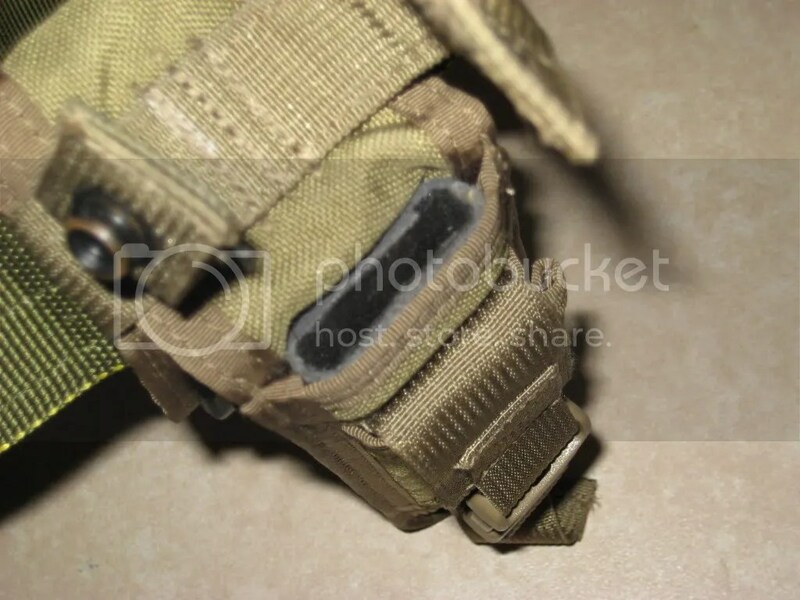 An accessory pocket fastened by Fastex clip is on the outside surface of the sheath. Suitable for a torch, pistol mag, multi-tool, sharpening stone, or other similarly sized kit. 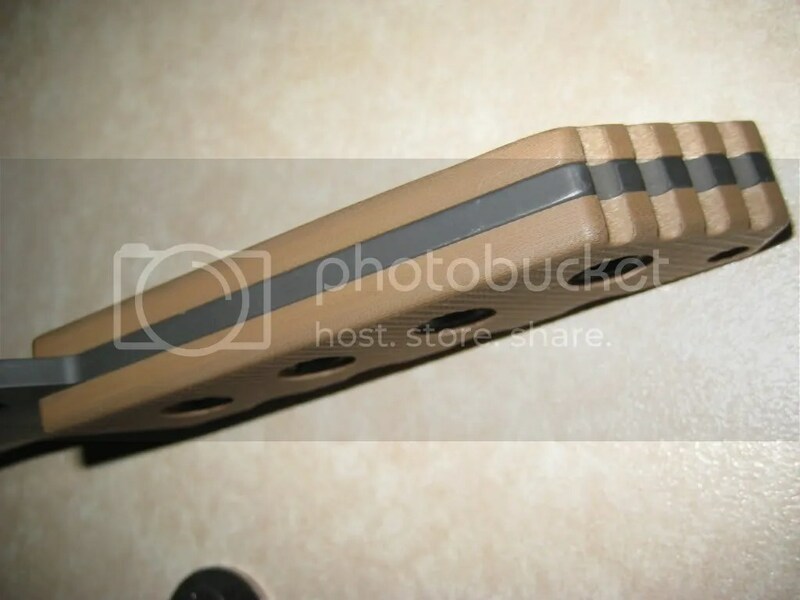 The inside of the sheath has a folded strip of cooked kydex, carpet like material on the blade side to both add a rigid guide for blade stowage and protect the edge. Very nice attention to detail. Personal Assessment: I was looking around for a decent blade to replace my old trusty K-Bar that I’ve been carrying for a few years. Since I have the cash to splurge (Thank The Dark Lords for still being young, single, and possess the skills to evade child maintenance ) I wanted to get something of quality that will outlast me, my children (when I find some lass who’s willing to tolerate and breed with me), and maybe even their kids. Intended as a general purpose blade, something that can do hard work around the camp, aid in dressing animals and general chores. Heavy chopping is something I carry a tomahawk for, so no need for any more than very light chopping. I wanted something classic, something that spoke of class, and culture. Yeah, it’s the only class and culture I’ll be having in my life, thank you very much!! I was looking at a Randall, but the 5 year waiting period kind of turned me off. I was also looking at a SOG Agency. It’s a nice looking blade, classical lines, and a bit of history behind the design. Unfortunately, I find SOG can be a bit hit and miss with some of their cutlery. The steel (BG42 I recall), whilst alright, wasn’t really what I like in a knife steel. The sheath was an abortion – very cheaply made, not a lot of thought put into it. The Dark Lords smiled on me then, when an opportunity arose on the Lightfighter Swapmeet. Unfortunately, the Global Financial Crisis has resulted in some amazing high end kit being sold by those who need to pay bills. Their loss is my gain, at least it keeps the repo man away and bills paid. It’s a bloody tragedy I can’t get some of the high end firearms currently on offer. Since the handle shape on my SnG has really impressed me the last few months, the chance to acquire another knife with a similar handle shape was very appealing. The G10 scales give a nice amount of control and comfort that I’ve not seen before. It is quite a small handle, length-wise but seems to fit my hands well (jokes about my endowment can stop… NOW, or I’ll cry myself to sleep in the corner). 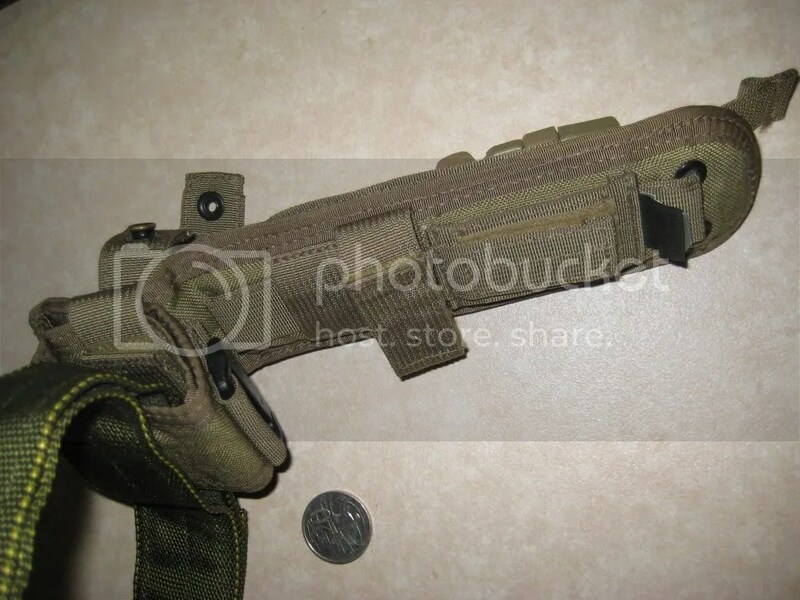 Since it’s slightly smaller in general dimensions compared to a Kabar, it fits my chest rig much better. Being more ergonomic, in that I don’t poke face, or get caught up in my arm pit like my old Ka-Bar did. More assessment as I find opportunities to use it. Posted in Civilian, Military, Miscellaneous Equipment by 22F with no comments yet.